On May 19, a 4-month-old male orangutan named Kecil arrived at the Milwaukee County Zoo for a possible pairing with the Zoo’s female orangutan, MJ. It was hoped MJ could eventually serve as Kecil’s surrogate mother. 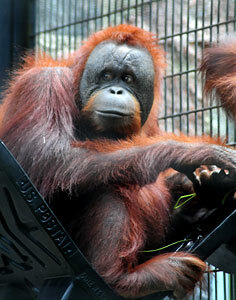 Kecil (pronounced Ka-cheel) was born January 11 at the Toledo Zoo. After months of dedicated but unsuccessful efforts to encourage his mother, Yasmin, to care for him, Toledo Zoo animal care staff determined the best course for Kecil’s well-being was that he be placed with a surrogate facility. When Kecil arrived at the Milwaukee County Zoo, he was accompanied by one of his keepers from the Toledo Zoo, and a keeper from the Milwaukee County Zoo to assist in the transition. Milwaukee County Zoo animal staff worked diligently, on a 24-hour basis, to introduce Kecil to MJ, and the initial results were positive. However, the optimal level of bonding we had hoped for was not attained. After various stages of progress, the process seemed to reach a plateau. Discussions then took place with the Orangutan Species Survival Program’s coordinator and Milwaukee County Zoo staff to determine the best course for the infant. It was decided it was in his best interest he move on to the Brookfield Zoo in Illinois for introduction to another potential surrogate mother, named Maggie. The transfer took place June 20, and the introduction process began. Maggie has shown considerable interest in Kecil from the outset and she continues to do so. We are hopeful the bonds that didn’t form here will form between Maggie and Kecil. The current existence of orangutans in the wild is severely threatened. Economic crises, combined with natural disasters and human abuse of the forest, are pushing this species to extinction. Experts estimate orangutans could be extinct in the wild in as few as 10 years.